Looking for information fast? Check out our Fast Facts Page for answers. Badger Pass Ski Area is now open for downhill, cross country ski, snow boarding, and snow play! Only 20 minutes by car from the lodge. A Luxury Vacation Rental Inside Yosemite National Park gates! Our Lodge Is Located Minutes From Major Valley Attractions. 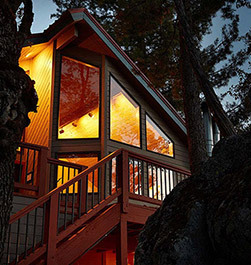 This Yosemite vacation home is located inside the gates of Yosemite National Park. Our 4 bedroom, 3 bath 3200 square foot multi-level luxury vacation rental home will delight and enchant your family, friends and business associates. Our lodge is perfect for couples, families and executive retreats. Unusual for most vacation rental homes in the Yosemite West community, the Peregrine Lodge is situated on a rather level area. This means you do not have to negotiate the steep stairs that earmark many nearby houses. Entering the home through a door on the same level as the parking, you will find easy access for the unloading of your luggage. There you will find entry to three guest bedrooms. This separation and intimate setting makes this home uniquely suited for multiple couples, families or groups to have a space of their own. The unique and cozy rooms are thematic in nature. 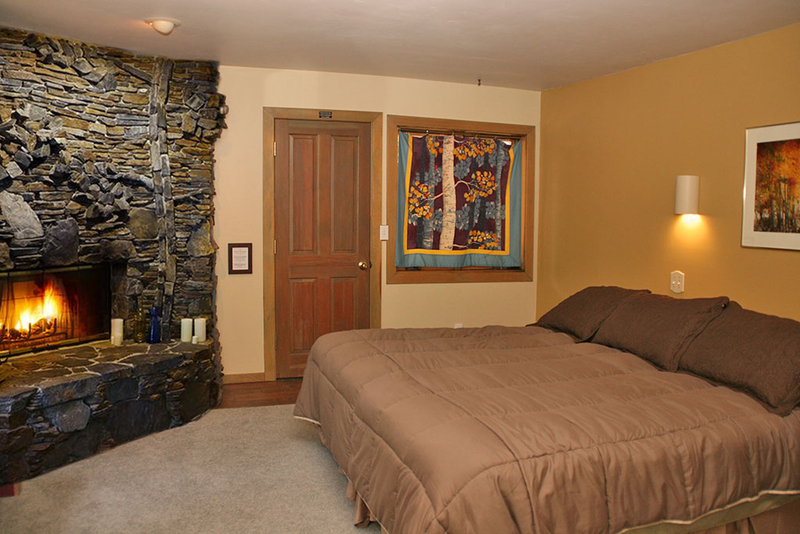 The main floor features a living room with a floor to ceiling rock fireplace with a design of Yosemite Falls. The plush and comfortable furniture in the great room will embrace you after a long day of exploring the park. Huge soaring windows in the great room opening west affords views of the forest and evening sunsets. Tiled floors heated in the winter offer a cozy warm environment in the colder months and nice cool floors in warmer weather. Bench seating which wraps around the room along the windows offer a great place to sit, read or have a favorite drink while you look out at the trees and distant mountains. Read a favorite book or borrow one of the many interesting books available in our library while your cares and concerns fall away. Or plan your next day's adventure with our many books and guides of Yosemite National Park. The dining room features a redwood dining table, a granite serving bar and lots more windows, a perfect place to share a meal with 8. 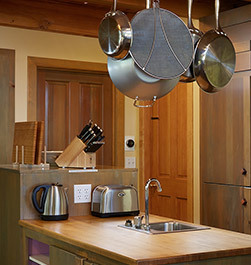 The kitchen has a large sub zero fridge, a preparation island, granite counter tops, two Bosch dishwashers (for large groups) and loads of cupboards filled with dishes, pots, utensils and basic supplies. For those BBQ chefs in your group, a gas grill is available on the deck right next to the kitchen. BOOK OUR INDIVIDUAL ROOMS BETWEEN NOVEMBER 1 AND APRIL 30. 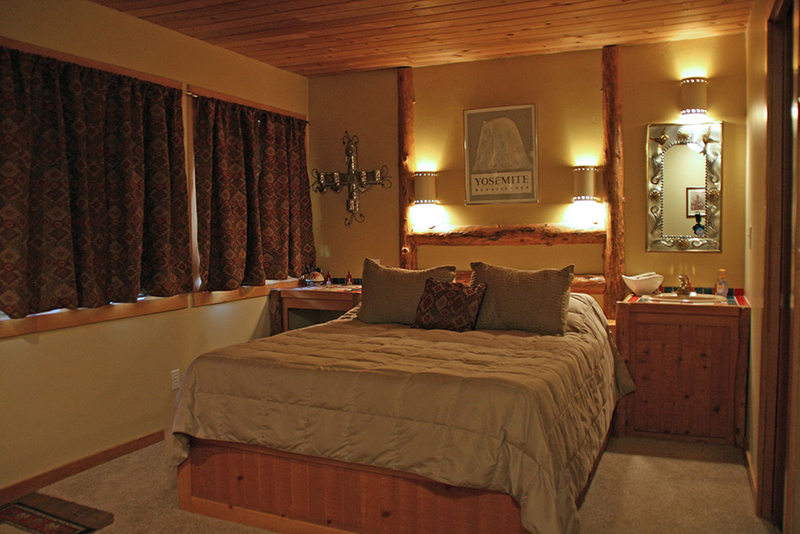 We are now offering our lodge on a room by room booking bases from November 1 - April 30. Each bedroom has private locked interior entries. They each have their own sink and shower, outdoor private deck area, a mini fridge, with complimentary coffee and tea, and a unique and beautiful floor to ceiling fireplace with fire starter and wood. One of the bedrooms even has a jet tub. Please note that during this period the upper floors of the lodge will not be accessible to our guests. David will be available for assistance should you need it, snow removal and advice on park attractions and directions. WANT TO BOOK THE ENTIRE LODGE? Our Lodge will still be available for groups to book the entire home during the winter but it will require a 4 night minimum stay for holidays. If you are interested in booking the entire lodge for periods between November 1 and April 30 please contact us directly for available dates. We think this will meet the needs of the Yosemite visitor interested in the park for fall and winter activities who may only want a single room, and others who may want the entire lodge for one group. We will continue to hold the entire home for Thanksgiving and Christmas bookings which are very popular family holidays. If our date range does not exactly match what you are looking for around those holidays just give us a call at 1-619-948-8560, and we can chat about your needs. Come and enjoy touring the Yosemite Valley and villages in the fall. Dine in the valley, and go ice skating at the half dome village when the weather gets colder, or visit the Badger Pass Ski Area for down hill ski, cross country skiing, and snow shoeing. 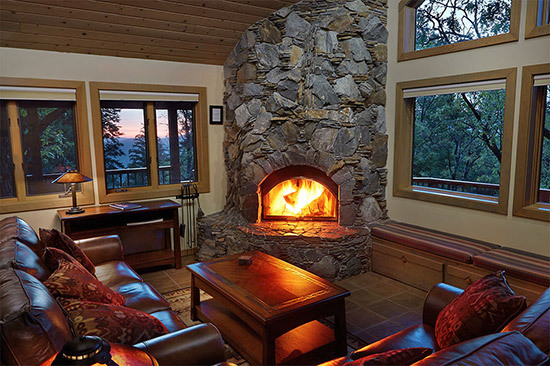 You will enjoy it all from our centrally located lodge inside the Yosemite gates. RATE: $160.00 per night *. The Dogwood room features thematic decor, a queen bed, private shower, bathtub for two, private outdoor deck, and custom fireplace. This is an end room. * 2 person max occupancy. RATE: $125.00 per night *. 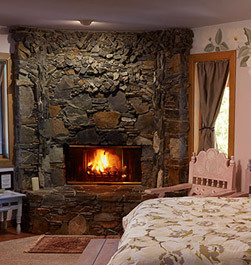 The Dogwood room features thematic decor, a queen bed, private shower, private outdoor deck, and custom fireplace. This is a middle room. RATE: $145.00 per night *. 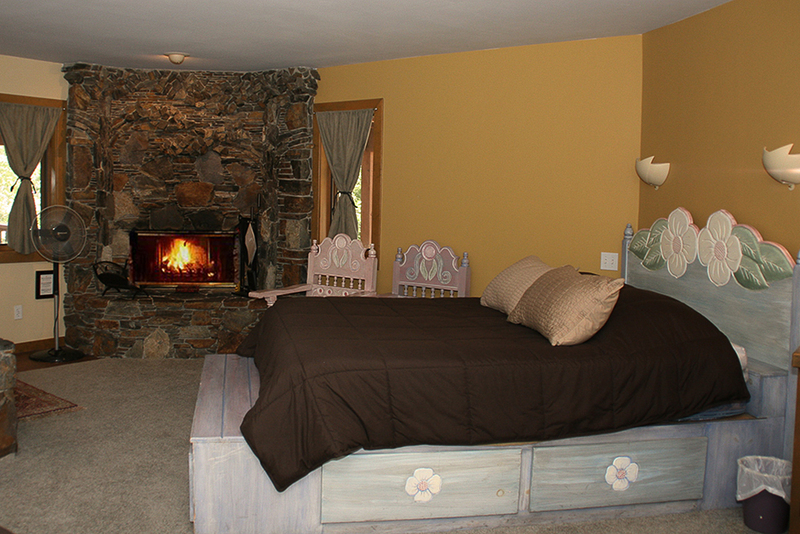 The Aspen room features a king bed, private shower, private outdoor deck, and custom fireplace. This is an end room. Constellations, planets, and galaxies too. Yosemite is more than a place, it is a state of mind. When a person enters the park, a tangible feeling of separation from the daily routine of modern life is felt. Whether you are here to hike, climb, play, adventure, relax, contemplate, re-unite with family and friends or just leave it all behind for a while you, will have an experience of a lifetime. We would love for you to share your special moment with us and with the world. What was your most memorable moment, place or event in Yosemite? Share with us by posting your unique experience and image by using #yosemiteperegrinelodge & @yosemiteperegrinelodge.com when posting to your Instagram account. Yosemite Peregrine Lodging. Encouraging Adventure and Defining Relaxation.